I don't want to go all Guardian on you but if I see the name of David Simon attached to a TV series then I start to get excited. He could potentially create a series about the pest control workers of Watford and I would be ready and waiting for the first episode. I have tried in the past when looking at The Wire and Generation Kill to pinpoint some of the reasons why his programmes are such good television but there must be a single word out there to describe the incredible feeling of relaxation and contentment that comes when you settle down to watch a TV programme that is quite simply excellent. The look, the casting, the script, the music, it all just works and, more to the point, feels a million miles away from the so-called quality drama made on this side of the Atlantic. After five seasons and 60 episodes Simon's superlative series The Wire had included many topics, memorable characters and set-pieces but turned out in the end to really be about nothing less than the city of Baltimore itself rather than simply its drug dealers and cops. 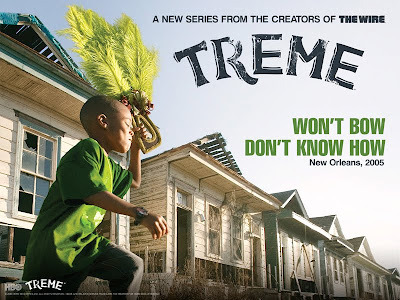 Treme, named for a neighbourhood in the city of New Orleans, is very clearly a programme about an area and its people, a people dealing with the aftermath of Hurricane Katrina, now three months in the past. It's appropriate that a natural disaster that has scattered people to the wind should beget a series of disparate characters and story-lines, but it is also part of the reason why the programme is so satisfying. There is no hurry to explain anything or the small connections between the seemingly separate threads. Frequently the scene you see isn't the one that would further the plot easily but the one that fleshes out the character (for example one character who plays the trombone goes to hospital with a split lip. In this country we'd see the scene with the doctor where he finds out whether he can still play or not. In Treme we see him in the waiting room, interacting with other patients about the state of healthcare and the city and then he sings a song, the scene ending when his name is finally called) or provides yet another example of what the programme is slowly building - a showcase for the cultural heritage of New Orleans. The most dominant strand of that is music. Oh man, the music in this series is incredible. Jazz, Be-Bop, Funk, Soul, Creole, styles-I-don't -even-know-the-name-of; the range is diverse, the playing incredible, the sheer amount of screen time given over to performance shows how much love there is for the music and however disparate the characters, music seems to play a part in just about all of their lives. Being a David Simon series it contains plenty of real-life musicians playing themselves including John Boutte, Kermit Ruffins, Coco Robicheaux, Elvis Costello, Dr. John, Steve Earle and Deacon John. The first episode begins with instruments being tuned, drinks being poured, negotiations over payment and then the late arrival of a familiar face; Wendell Pierce, who memorably played Bunk in The Wire, is now New Orleans native Antoine Batiste, trombone player and almost inevitably a 'playa' of another sort too. Whether it's dodging cab fares or juggling his complicated personal relations I can't think of another actor who could so successfully charm you and make you laugh even whilst behaving despicably. Clarke Peters is back too, but gone is the moral rock of Lester Freamon from The Wire, here he plays a far more ambiguous character, Albert "Big Chief" Lambreaux, head of a tribe of Mardi Gras Indians. If you've ever seen pictures of men dressed in elaborate feathered costumes you might be surprised to know a little more about the history behind them. I say ambiguous because whilst he is a man of principle he is also a man prepared to beat another man close to death after stealing from him. He is almost incapable of avoiding confrontation and whilst he quietly goes about restoring his bar, ruined by Katrina, and slowly working on the costumes for this year's march he is one of several spearheads prepared to take on the official response to the disaster. The plot, if you want to call it that, is driven by the search by LaDonna Batiste-Williams (played by Khandi Alexander, the observant amongst you will have spotted that this is Antoine's ex-wife) for her brother, missing since Katrina. Aided by lawyer Toni Bernette (Melissa Leo) they become immersed in a mountain of bureaucracy as they chase paperwork from one department to another, charting the confusion of police procedure and incarceration in a manner that will be familiar to anyone who has read Dave Eggers' Katrina-novel Zeitoun. Toni Bernette is the wife of Creighton, played by the instantly recognisable John Goodman, a University professor and anti-establishment firebrand. His forays into the new social media, hilarious rants that he videos on his webcam and uploads to You Tube, will lend him a new notoriety in the neighbourhood but also provide us with something of a direct link to the feelings of those on the ground. As the series progresses it is good to be reminded that when a disaster ceases to be a news item it doesn't suddenly stop being a disaster for those living with the consequences. Steve Zahn provides almost constant comedy in his role as part-time DJ and musician Davis McAlary. His passion for not only the music but the wider culture of New Orleans finds its expression by various, and always enthusiastic, means. From an old Louisiana family he's the kind of guy who thinks it's ok for him to use the 'n' word because he's lived his whole life in the Treme district (unfortunately for him one guy in the bar doesn't see things the same way). His on-off relationship with chef Janette Desautel provides a link to another part of the culture - food. Anyone who appreciates good food will find themselves with mouth-a-watering as the episodes pass by. A city made up of people from all over the globe of course produces cuisine that reflects those influences and as Janette struggles to keep her high-end restaurant running amidst lower numbers, gas cut-offs, and creditors closing in, her sheer passion for food is infectious. In fact passion is a really important theme. Whether it's passion for music, food, history, literature or politics; the desire to find lost family or mark their passing, rebuild your home or even the city, uphold what's sacred or tear down what's corrupt, each and every character does so with a passion that is characteristic of those with something worth saving in the face of adversity. As a collective, the city is preparing for carnival, and doing so in defiance of those who want to stop it happening at all. The importance of the 'second line' to each member of the cast is palpable, the importance of being able to uphold tradition despite hardship, the importance of showing what New Orleans has that no other city can replicate. It is a very positive energy that drives all of this forwards. We believe what we watch is genuine because it is felt by everyone involved to be genuine, because for many of them it is. New Orleans wasn't wiped off the map by Katrina but Treme shows that the actions of politicians after the event could have had as devastating an impact as the natural disaster itself, for anything that threatens the distinctive culture of a region threatens to wash away the region itself. This series is already a testament to that culture but is also uniquely entertaining, lovingly created and thrillingly subversive. Please watch it if you can.